For locations where the fence is as much a feature as the view, we recommend Post & Rail fencing to add a rustic charm. We've completed several such fences (in Oxshott, Horsley or Clandon, among others) to help our clients suggest a simple yet striking open-plan look for their area. 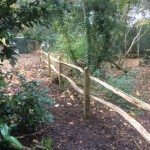 While simply designed, the fencing remains as sturdy as the rest of our services range and can be built to suit a range of heights and other requirements. The design is ideal for the fronts or sides of your home, overlooking fields and gardens. "Very good service and very polite workman. Excellent work and quality finish."